The attorney general's office doesn't want people to be tricked into sharing their private information. Anyone who receives a text like that should file a consumer complaint immediately. INDIANAPOLIS -- It's not unusual to see political signs around town, but one woman says she recently received a political ad as a text message. 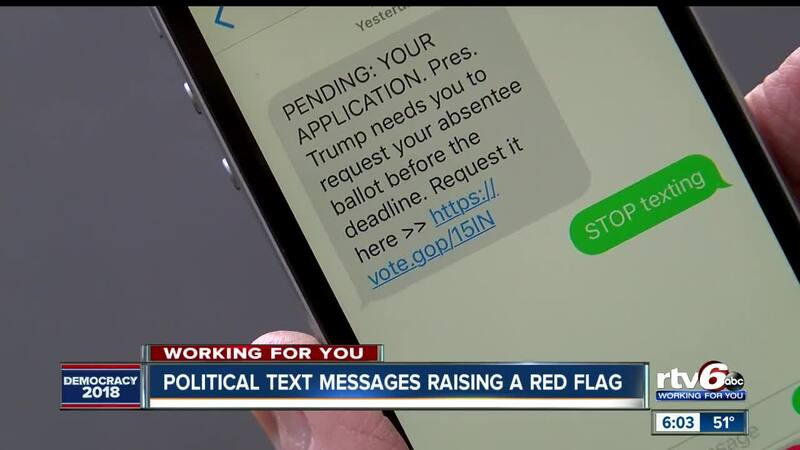 Toni Panyard said she has no idea who sent the message, which stated that "President Trump needs to request your absentee ballot before the deadline" and included a link to an app. "I felt it was suspicious, because I don't give my cellphone number out," she said. She's not the only person who got one of the texts. Her daughter, Jessica Williams, received a text from something called "ResistBot" encouraging her to remember why she is voting in the upcoming election and to make a pledge. "I don't reply to stuff that I don't know where it's coming from," Williams said. A company called ResistBot does have a website for a service that's supposed to be used to send messages to political candidates and uses the same phone number Williams' text came from, but it's still unclear who sent it to her. 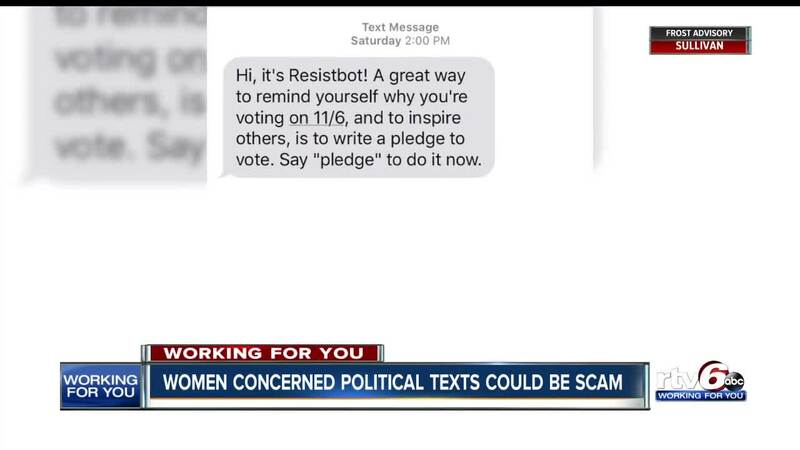 Jason Putorti, cofounder of Resistbot, reached out to RTV6 saying it was Resistbot that sent the text to Williams, but that it is not a scam. Putorti send a screenshot of Williams' phone number with a date of Sept. 5, 2017, saying she signed up for the service. Williams said she did not sign up for the service. Panyard took action after seeing the unwanted texts. "Right away I reported it to the attorney general," she said. 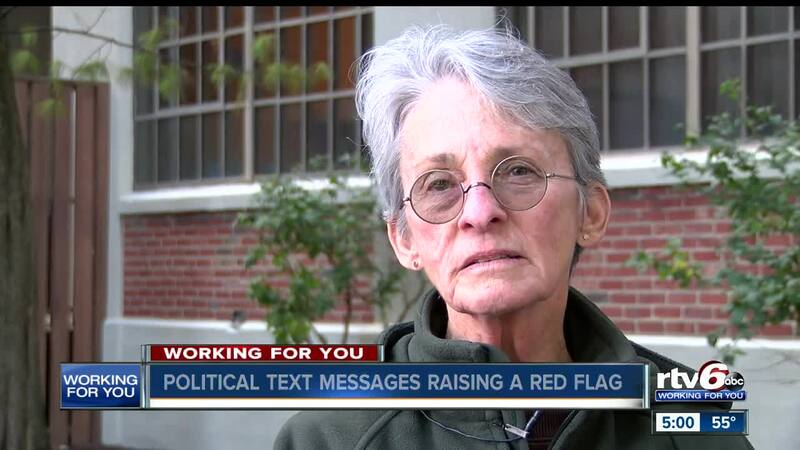 Linda Hughes received the same text as Panyard. "It was invasive and, again, it was creepy," Hughes said. "I don't know how they received my number." Hughes said she suspected that someone could be targeting her due to her age, to reveal private information. The Federal Trade Commission offers some guidance on its website, stating that text message spam is illegal, except in cases involving political surveys or fundraising messages. Panyard tried calling the number. She reached a voicemail saying it was a non-working number. "I definitely want people to vote, I just don't want to be solicited to my phone," she said. If you feel like you're getting illegal texts, you can file a complaint with the FCC. Click here for more information.